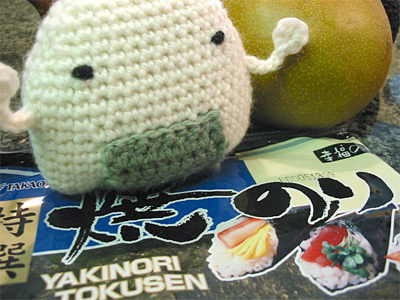 An omusubi is a rice ball wrapped with a piece of nori, or dried seaweed; an obake is a kind of ghost or spirit. 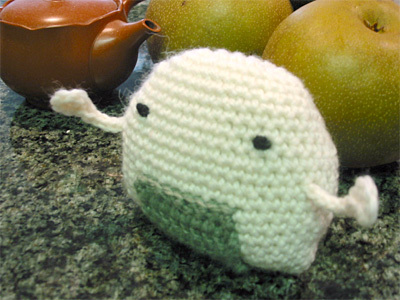 This little rice ball ghostie appeared last night and started haunting our kitchen. He seemed pretty at home in our box of curry mixes. 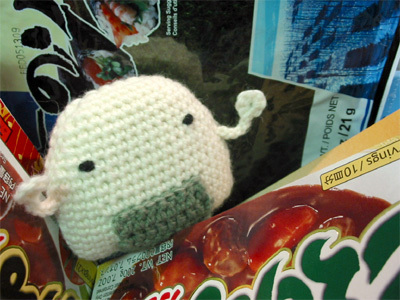 And of course stopped to pay respects to the package of nori. But eventually he decided to haunt the box of Taiwanese pineapple cakes. I think I will too; I’m hungry! 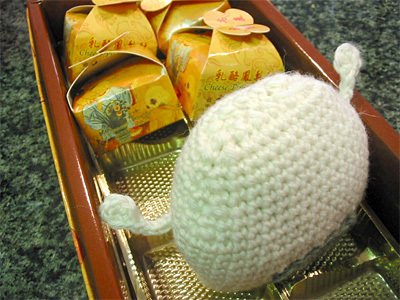 CogKnition posted this on November 20th, 2008 @ 10:07am in Crochet, Finished Objects, Toys | Permalink to "Omusubi Obake"